Gernard Hill, a man of music, and a Louisiana native, is the true meaning of “Laissez Les Bons Temp Rouler” (let the good times role). Gernard honed his instrumental skills in trombone and piano early on in his adolescent years. As a band member of the Leesville High Wompus Cats he quickly soared to musical leadership, as his high school’s drum major, earning a plethora of instrumental awards and honorable mentions. Shortly thereafter he continued his matriculation in musical education and performance at Grambling State University. 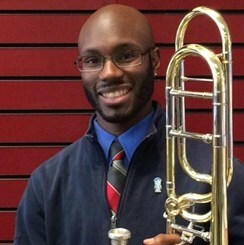 At GSU he became a member of the world famed Tiger Marching Band and received a Bachelor of Arts in Music Performance.